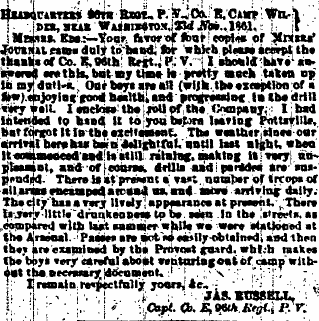 This letter was written by Captain James Russell of Company E while the 96th Pennsylvania encamped east of the Capitol on the Bladensburg Turnpike. It was published in the Miners’ Journal in Pottsville, Pennsylvania on November 30, 1861. In it, we hear from Captain Russell that training of the men continues, and that military discipline exists where chaos had reigned in Washington only a few months prior. Many of the enlisted men and officers in the 96th had previously served in 90-day regiments in the summer of 1861. As for newspapers in camp, the 96th Pennsylvania were well-supplied with news from their homes in the Keystone State’s anthracite coal fields. Copies of the Miners’ Journal and other local papers often accompanied mail from the folks at home. The weather since our arrival here has been delightful, until last night, when it commenced and is still raining, making it very unpleasant, and of course, drills and parades are suspended. There is at present a vast number of troops of all arms encamped around us, and more arriving daily. The city has a very lively appearance at present. There is very little drunkenness to be seen in the streets, as compared with last summer while we were stationed at the Arsenal. Passes are not so easily obtained, and then they are examined by the Provost guard, which makes the boys very careful about venturing out of camp without the necessary document. I remain respectfully yours, etc. Capt. Co. E, 96th Regt., P.V.